FIRST LOOK! The New 2010 NASCAR Nationwide Series Cars! Penske Racing's #12 Verizon Wireless Dodge Challenger. The 2010 Toyota Nationwide Series Camry. Richard Childress Racing's #29 Holiday Inn Select Chevrolet Impala. Roush Fenway Racing's #16 Conway Freight Ford Mustang. Dodge Challenger nose detail. Sweeeeeet! Joe Gibbs Racing announced today that Dave Rogers will replace Steve Addington as crewchief on Kyle Busch’s NASCAR Sprint Cup Series team for the final three races of this season. 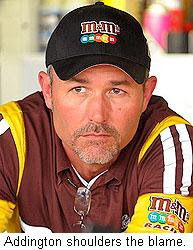 Rogers currently serves as a Joe Gibbs Racing Nationwide Series crewchief, working primarily with Joey Logano. Addington will remain atop the pit box for this weekend’s race at Talladega Superspeedway, after team management determined that there was not enough time for Rogers to take over before then. Busch failed to qualify for this year’s Chase despite winning four races, and has just one victory in his last 21 starts, to go with nine finishes of 20th or worse. He finished fourth Sunday at Martinsville. Sadler A Ford Man At Dega: Richard Petty Motorsports has confirmed what Sirius Speedway first told you last month; that the team will field a Ford Fusion for the first time this weekend at Talladega Superspeedway. The Emporia, VA driver will be back in a Dodge for the final three races of the season at Texas, Phoenix and Homestead, and will join us on today's show to talk about the move. Andretti Backs Late Caution: John Andretti says NASCAR was right to delay throwing the yellow flag when he spun on the frontstretch on the final lap Sunday at Martinsville Speedway. "It wasn't a bad call. I wasn't in a great position, but I wasn't in an overly dangerous position,” he said. “NASCAR focuses on the race itself, and they want to see the winner come across the finish line. It's probably the call I would've made. I would've gotten out of the way if I could've, but I had a couple of issues. The car was too damaged." Post The #66: Steve Wallace faces possible sanctions from NASCAR after running into Matt Kenseth’s car on pit road after Saturday’s race at Memphis Motorsports Park. Wallace spun after contact with Kenseth late in the race, then drove down pit road and into the side of Kenseth’s car. He was summoed to the NASCAR hauler after the race, and penalties – if any – will likely be announced later today. Tags To Texas: Canadian driver Alex Tagliani will run the NASCAR Nationwide Series race at Texas Motor Speedway on November 7. Tagliani announced on his blog Monday that he will drive the same Dodge he ran at Montreal’s Circuit Gilles Villeneuve in August, fielded by MacDonald Motorsports. The race will mark his first career TMS start. Joe Gibbs Racing drivers Joey Logano and Kyle Busch give WWE superstars Chris Jericho and "The Big Show" their marching orders during last night's broadcast of WWE Monday Night RAW at the RBC Center in Buffalo, NY. Busch played the heel's role, drawing the crowd's ire by mocking their beloved Buffalo Bills. Logano proved more popular, calling Big Show "weak" and matching him against fan-favorite Triple H in the night's main event. How Do You Miss A Mouth That Big? "Tradin' Paint" co-host Chocolate Myers is known to enjoy an occasional snack during the four-hour run of the show. 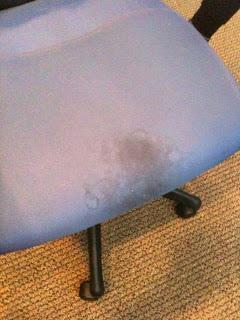 Apparently, however, a large percentage of that Easy Cheez ends up missing the mark and hitting the chair. Amazingly, this is Choc's SECOND chair in the last two years. Apparently, the first one had to be thrown away because of a giantic, crotch-shaped grease stain. Go figure. Hey Joey! Wrestle This One! WWE Diva Kelly Kelly is primed and ready to take on all comers on next week's edition of WWE Monday Night RAW, hosted by Joe Gibbs Racing teammates Joey Logano and Kyle Busch. Put her in a headlock, Joey! NASCAR Nation plunged into a state of collective despair today, after 2007 Formula One World Champion Kimi Raikkonen said that he can race in NASCAR next season if he wants to, but is not a fan of stock car racing. NASCAR fans across the country responded with a collective yawn, before failing to select Raikkonen out of a photo lineup. Dale Earnhardt, Jr., finally vented the frustration of a long and trying season last week, saying he is upset with his team’s poor performance and has no idea what to do about it. Earnhardt's Hendrick Motorsports teammates -- Jimmie Johnson, Mark Martin and Jeff Gordon – currently fill the top three positions in Sprint Cup championship points, while Earnhardt languishes a distant 22nd in the championship chase. The 48, 5 and 24 teams have combined for 11 Sprint Cup victories this season, while Earnhardt’s winless streak is now more than a year long. 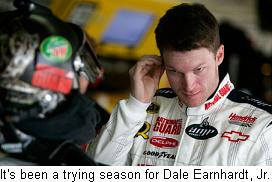 Earnhardt said he is puzzled by his team’s inconsistency, admitting, “I don't know what to do. We were top-15 in practice (at Lowes Motor Speedway) and we go out to qualify and we were one of the worst cars here. It's really encouraging one day and the next day it's equally discouraging. That gets really old. I'm about to the end of my rope on it." Asked whether he will team with crewchief Lance McGrew again in 2010, Earnhardt said, "I don't have the credentials to make the call. If I told you that I wanted to be with Lance next year, I wouldn't be telling you that out of my knowledge of expertise and talent. I'd be telling because it's fun hanging out with him. Hell, (I) don't even know if Lance wants to do it. I wouldn't want it. It's a tough job." Team owner Rick Hendrick indicated that he is leaning toward returning McGrew to the pit box next season, saying he prefers to fine-tune, rather than rebuild. For his part, Earnhardt said he needs a “dictator” like Tony Eury Sr. atop his pit box, immediately stressing that he is not ruling out McGrew. 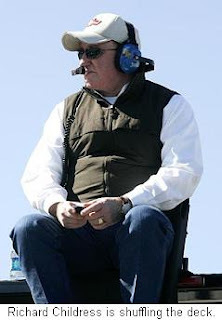 Eury, Sr., however, has repeatedly stated that he is not interested in returning to the Sprint Cup Series, and is happy in his current position as crewchief for the #88 JR Motorsports NASCAR Nationwide Series team. Earnhardt's frustration is genuine and deep-seated. It's nothing a win or two won't cure, but at his present clip, Junior does not appear headed for Victory Lane anytime soon. Johnson On Track For Four: While Earnhardt struggled, Jimmie Johnson took a major step toward an unprecedented fourth consecutive NASCAR Sprint Cup Series championship Saturday night at Lowes Motor Speedway, winning the NASCAR Banking 500 (his second straight win and his third in the last four starts) and triggering another round of complaints from observers tired of seeing the same championship trophy go home in the same set of hands. Johnson’s win combined with poor performances by many of his closest championship pursuers to bust a razor-close title chase wide open. Johnson and crewchief Chad Knaus now enjoy a healthy, 90-point advantage in the championship standings; the biggest lead any team has enjoyed at the halfway mark of a Chase. A year ago, Johnson was 69 points ahead of Jeff Burton after five Chase starts, and Jeff Gordon led Johnson by 68 at this juncture in 2007. The anti-Johnson contingent is divided into two distinct groups; those who resent his success, and those tired of seeing their favorite driver come up short by comparison. The first camp contains at least a handful of his fellow drivers and team owners. Jack Roush continues to carp about the preferential treatment he fears Johnson and his Hendrick Motorsports teammates receive from NASCAR. The Roush Fenway Racing owner is still waiting to see how NASCAR will address rumors of discrepancies with Johnson’s car; rumors that Roush refuses to discount despite three consecutive weeks of white-glove inspections by NASCAR at their Concord, NC, Research and Development Center. Greg Biffle complained bitterly about Johnson’s inclusion in a late-season Goodyear tire test at Dover, saying that test gave the Lowes Chevrolet team a decided advantage in Round Two of the Chase. Those complaints ignore the fact that one of Biffle’s own teammates, David Ragan, also took part in the test, giving Roush Fenway Racing access to the same information enjoyed by Johnson and Knaus. 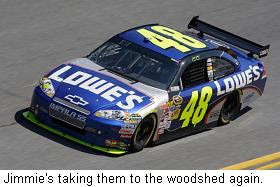 Simply put, Jimmie Johnson and the Lowes Chevrolet team are the class of the field again in 2009, and their chances for a four-peat grow stronger with every passing week. While those around him stumble, Johnson simply grows stronger, beating the competition at its own game. Resent him if you like. Hate him for beating your favorite driver if you must. But take a moment along the way to appreciate something that has never been seen before in the near-60 year history of this sport. Jimmie Johnson is just that good. RCR Could Drop To Three Cars: Richard Childress said Saturday that major changes are coming for his race team, and that Richard Childress Racing could be a three-car operation in 2010. Sirius Speedway reported Friday that Todd Berrier will be announced as the new crewchief of Jeff Burton’s #31 Caterpillar Chevrolet later this week, and Childress confirmed that additional personnel announcements are expected. Childress said he sees improvement in his team’s performance in recent weeks, but that the future of Casey Mears and the #07 Chevrolet is unknown. No full-time sponsor has been signed to replace the departing Jack Daniel’s next season, and Childress said the team will not continue without one. Sirius Speedway has learned that a press conference will be held early next week to announce personnel changes on Jeff Burton’s #31 Caterpillar Chevrolet team, including the signing of crewchief Todd Berrier. Berrier will replace Scott Miller, who was recently promoted to Director of Competition at RCR. Berrier has been a crewchief in the RCR organization since 2002, most recently working with drivers Kevin Harvick and Casey Mears. He has eight career Sprint Cup Series wins, including the 2007 Daytona 500 with Harvick. Sources close to the team say a meeting was held this week between Childress, Miller and Berrier to implement a transition plan, and to decide which members of Burton’s over-the-wall and race day crews will be retained. Sources say some personnel changes will be implemented as soon as next week, with an official announcement expected on Tuesday. Burton told reporters yesterday that the team is close to finding a new crewchief, and that a reorganized RCR will be stronger and better-prepared in 2010. "We're real close," he said. “I don't have a definite date, but we're real close to having all that figured out. We're really optimistic that we have that put to bed and we'll be able to talk about that fairly soon." Burton also said that Childress is not solely to blame for the recent downturn at Richard Childress Racing, saying the ban on off-season testing and an unwillingness to try new things led to the team’s poor performance. In a related story, Burton said he does not expect teammate Kevin Harvick to remain with RCR beyond the end of his current contract in 2010. Harvick said in a pre-race interview with ESPN’s Marty Smith Sunday that he doesn't plan to compete for RCR beyond next season, and Burton said he believes the time may have come for a parting of the ways. "Sometimes you are just better off going to the dentist and getting it over with," he said. "I think everybody is behaving in a very professional manner. Everybody is understanding that Kevin has a year left on his contract, and he's going to do everything in his power to do the best job for RCR." TRG Motorsports owner Kevin Buckler is actively investigating the possibility of converting his NASCAR Sprint Cup Series team from Chevrolet to Dodge next season, and mulling a full, 36-race assault with former series champion Bobby Labonte. TRG has been a Chevrolet team from its initial foray into NASCAR, but only because Buckler purchased his cars and engines from Richard Childress Racing. He told Autoweek magazine this week that he receives very little support from General Motors, and needs additional help to become a frontrunner in the Sprint Cup Series. Buckler said he is “very much interested in talking to (Dodge),” and has spoken with fellow team-owner Roger Penske about the possibility of changing manufacturers. "I think it would be a great fit," he said. "You look at how much we've done this season with so little, and I think it shows we have a lot to offer." A Dodge spokesman said the automaker would "absolutely" be interested in speaking with Buckler, adding, "I think we'd be crazy not to consider what he could bring to the party, especially if he could bring Bobby Labonte for the full season." With Richard Petty Motorsports poised to jump to the Ford camp next season, Dodge would be left with only a three-car stable in 2010; all fielded by Penske Racing. TRG is currently 37th in owners' points, just two positions away from a guaranteed starting spot in the first five races of 2010. 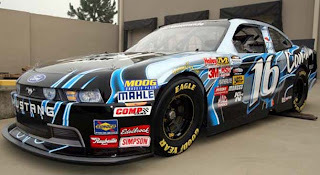 Labonte would also bring a Past Champion’s Provisional to a team that has failed to qualify just once in 30 races this season, despite limited sponsorship and a revolving-door driver roster than has included Labonte, David Gilliland and Mike Bliss. Buckler also restated his desire to expand to two cars next season, if sponsorship can be found. First Look At The New Nationwide Series Mustang! Colin Braun will drive this #16 ConWay Freight Ford Mustang in four events on the 2010 NASCAR Nationwide Series. SHARP! 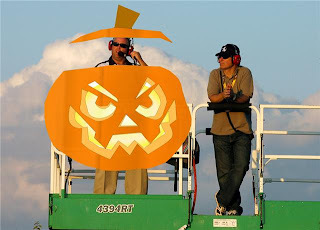 BREAKING NEWS: Godfather Physically Attacked At Kansas Speedway! 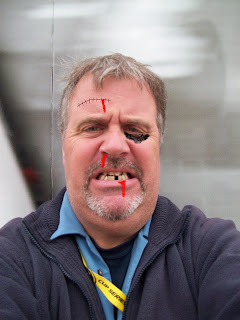 In a shocking development, Sirius Speedway host Dave "The Godfather" Moody was savagely attacked by NASCAR Sprint Cup Series drivers David Reutimann and Elliott Sadler Friday at Kansas Speedway. The unprovoked daytime attack left Moody with serious injuries that required the popular Sirius NASCAR Radio host to seek medical attention. Unconfirmed reports have Moody obtaining the services of high-profile attorney Mark Geragos to file a civil lawsuit against both Reutimann and Sadler, requesting $12.5 million for pain, suffering and emotional distress. "Fortunately," said Moody, "my good friend, award-winning motorsports photographer Dave Condit, was able to document the attack. It might have been nice if had had put down the camera and come to my assistance, but barring that, at least we had concrete evidence of this vicious, unprovoked assault." 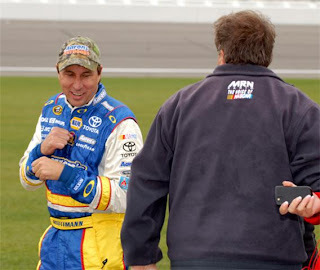 In the first photo of the series, a menacing Reutimann threatens Moody with physical violence. 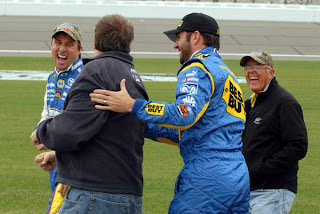 Almost immediately, Moody is jumped from behind by co-conspirator Elliott Sadler. 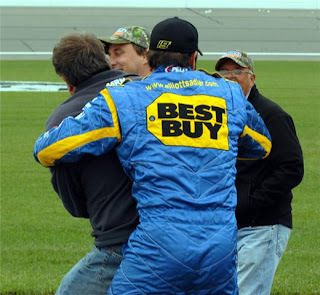 With the Godfather's arms pinned behind him, Reutimann administers a savage beating. The shocking aftermath of the assault. 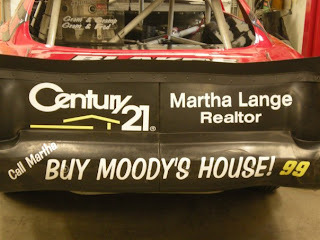 Now THAT'S A Hard-Working REALTOR!